USS DEWEY was the 9th FARRAGUT - class guided missile destroyer and the second ship in the Navy to bear the name. Delivered to the Navy on December 2, 1959, the ship was commissioned five days later, Commander E. R. Zumwalt, Jr. - who later became the youngest man ever to serve as Chief of Naval Operations (CNO) in 1970 - in command. Commissioned as a guided missile frigate (DLG), the USS DEWEY was reclassified as guided missile destroyer (DDG) on June 30, 1975, changing its hullnumber from DLG 14 to DDG 45. 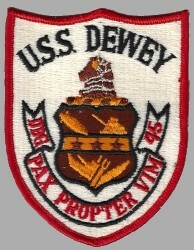 Decommissioned on August 31, 1990, and stricken from the Navy list on November 20, 1992, the DEWEY was sold for scrapping on April 15, 1994. This section contains the names of sailors who served aboard USS DEWEY. It is no official listing but contains the names of sailors who submitted their information. 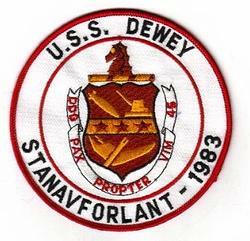 Click here to see which USS DEWEY memorabilia are currently for sale on ebay. USS DEWEY suffers an explosion and fire in the boiler room while preparing to sail from Toulon, France, killing three. USS DEWEY suffers a fire which damages the missile control system while in port Naples, Italy. George Dewey, born 26 December 1837 in Montpelier, Vt., graduated from the Naval Academy in 1868 and after varied important service assumed command of the Asiatic Station 3 January 1898, with his flag in the protected cruiser OLYMPIA. On the night of 30 April 1898 Admiral Dewey led his squadron into Manila Bay and the next morning in 2 hours destroyed the Spanish fleet without a single American loss. Admiral Dewey was relieved of his command 4 October 1899 and ordered to Washington, D.C., where he was designated President of the General Board. On 24 March 1903 he was commissioned Admiral of the Navy, a rank created for him, which he held until his death 16 January 1917.